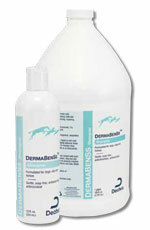 You are buying the Dechra DermaBenSs Shampoo For Cats Dogs Horses 12oz Each, model #12BPPW. At ADW Diabetes, we offer a wide selection of Dechra products for cats and dogs. At ADW Diabetes, we offer single and bulk packaging giving you the opportunity to save even more on the products that you use the most. The Dechra DermaBenSs Shampoo For Cats Dogs Horses 12oz is designed for use on oily and scaly skin (seborrhea oleosa), superficial and deep pyodermas, crusty pyodermas, and can also be used as adjunctive therapy for generalized demodicosis and Schnauzer comedo syndrome or other causes of folliculitis. Studies have indicated that benzoyl peroxide may also be effective when topically treating methicillin-resistant Staphylococcus infections. Gentle, soap-free, no sulfur oder. 2.5% Benzoyl Peroxide* provides antimicrobial (especially antibacterial), keratolytic, comedolytic (follicular flushing), and degreasing actions. 1% Sodium Thiosulfate (Sulfur) provides keratoplastic, keratolytic, antibacterial, antifungal, and antiparasitic benefits. 1% Salicylic Acid provides mild antipruritic, antibacterial, keratoplastic, and keratolytic actions; lowers the skin pH and increases corneocyte hydration. Salicylic acid and sulfur have shown to be synergistic in their keratolytic actions. Ceramides aid in moisturizing, repairing, and restoring dry damaged skin. *Benzoyl Peroxide may bleach fabrics and other absorbent materials, Use carefully (gloves are recommended), and avoid contact with clothing and furnishings.